← Sloane Stephens Talks Twitter and Tennis For Citi Open. U.S. Open Series Preview: All Eyes On Fish This Summer. 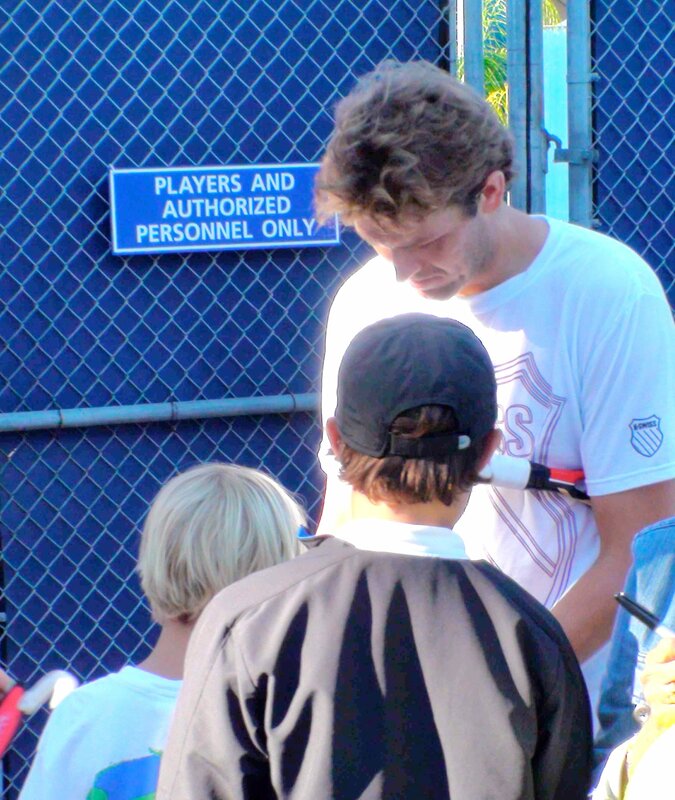 Mardy Fish Signs Autographs at Last Year's Farmers Classic in L.A. (Credit: E. Gudris). With the summer hardcourt season about to kick off here in the U.S., tennis fans are turning their attention to what feels like a never-ending roadtrip that the stars take across North America on their way to their final stop in New York at the end of August. One man who will be hitting the road harder than almost anyone this summer will be new U.S. No. 1 Mardy Fish who will headline next week’s Atlanta Tennis Championships as the first of six tournaments he’s scheduled to appear at. The WTA summer season should be a real treat with both Serena and Venus Williams committing to play a full schedule of events, the return of Kim Clijsters after injuries forced her out of much of the clay court season and Wimbledon plus the continued rise of Maria Sharapova and her return to top 5 status. Add in rising star and new Wimbledon champion Petra Kvitova along with French Open champion Li Na and you’ve got the making of some potential blockbuster matchups along each stop of the WTA tour that includes two new events in Maryland and North Texas. Even with Serena taking most of the spotlight at each event she plays, it could be another American, Bethanie Mattek-Sands and currently the U.S. No.1, who could grab more attention with her game and not for her outrageous clothing choices. But don’t be surprised if it’s a young American like Christina McHale, Coco Vandeweghe or Sloane Stephens who makes a deep run somewhere, sparking hope once again that America’s next great female player is on her way sooner rather than later. On the ATP side of things, if you want to see one of the top five guys play this summer, pack your bags either for Cincinnati or Montreal, as Djokovic, Nadal, Federer, Murray and Soderling aren’t venturing out further than they are required to do. It’s a bit of shame as last year Murray subbed in for Djokovic last minute at the L.A. event, adding some much needed star power there. Even this year’s Legg Mason event in D.C, which normally snags at least one top 5 player each year, will have Mardy Fish as its top seed along with Gael Monfils and Andy Roddick. But even with Djokovic trying to maintain his near perfect season on his way to a possible third Major title in New York, it could be Fish and Roddick who make the most news this summer, depending on their results. Unlike last year where Fish surprised many by his comeback summer, winning Atlanta and reaching the finals of Cincinnati, Fish this year comes in as the top American player and will have to deal with the added pressure of that mantle and defending quite a few points. Fish’s ambitious schedule, which has him scheduled for six tournaments, will ensure American fans will get a chance to see him somewhere this summer. But if Fish wears himself out before New York is another question. For Roddick, who managed an ok summer last year despite dealing with a mild case of mono, this summer all eyes will be on him to see if he can turnaround a less than stellar 2011 that have many openly saying Roddick’s best days are behind him. Finally, one player to watch for sure is Juan Martin Del Potro, who loves hardcourts and could end up being a U.S. Open favorite depending on how his summer season, which kicks off in L.A, ends up. But don’t be surprised if a marquee player ends up taking a last minute wildcard at the Winston-Salem Open, the newest ATP event and last stop for the U.S. Open Series. The summer hardccourt season is upon us. I’ll be in Atlanta next week covering the Atlanta Tennis Championships for Tennis Panorama News. Be sure to follow my Twitter updates on @GVTennisNews and on here for daily updates. Comments Off on U.S. Open Series Preview: All Eyes On Fish This Summer.